Zoho's productivity applications assist you in managing your business in a more practical and constructive manner. Currently Zoho offer Calendar, Notebook, Planner, Sheet, Show, Writer, Viewer, Office for Microsoft SharePoint, and Plugin For Microsoft Office as online productivity solutions. Here we showcase three of these applications and if you would like to know more about any of the productivity applications from Zoho just drop us an email note to info [at] mangoho dot com or fill out the form here with your requirements and we will respond within one business day. 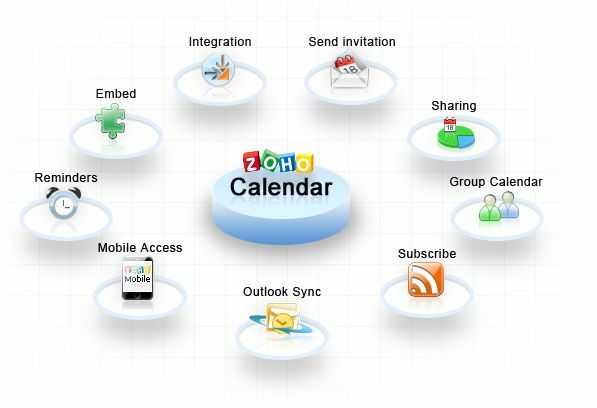 Individuals, teams and groups can share create, manage schedules and track meetings and events online using Zoho Calendar, which can provide a unified view across many other Zoho applications, including Zoho CRM And Zoho Projects and can be accessed using mobile devices. Team members become more productive and efficient using the group feature, sending and receiving invitations, creating and editing events, and receiving reminders by email. Zoho online calendering is easy and quick to use, and, importantly, is subscription free. Zoho Sheet is an online spreadsheet app that allows you to create, share and collaborate interactive spreadsheets which can be accessed anywhere, anytime, and supports multiple users sharing and collaborating on sheets at the same time. Confused with different versions of the same spreadsheet that have been distributed as an attachment? Then use Zoho Sheet, online. Zoho Sheet online spreadsheet app is easy and quick to use, and, importantly is subscription free. Create, take and deliver your presentations anywhere, anytime. Collaborate on your presentations with multiple users at the same time and deliver them quickly and effectively. And if you are confused with different versions of the same presentation that have been distributed as an attachment, then use Zoho Show, online. Currently Zoho Show is in Beta test mode and is completely free. A free version is available for personal use, and Zoho Show, as part of Zoho Business Premium Editions, will be affordably priced when fully released. For more information on the cloud based Zoho productivity applications' features and details of Mangoho's training and support packages contact us here or drop us an email at info [at] mangoho dot com.